I’ve had this recipe for Pumpkin Bars forever — one of those handwritten, spattered, tattered, cornerstone recipes. I love to make it in the fall when pumpkin is readily available. It has a nice autumn spice fragrance and a deep rich color that is so satisfying. It goes together in a snap and because it is in a jelly roll pan, it also bakes quickly. Less than 10 minutes to make it and 25 to bake and your dinner menu rises to a new level. Serve with whipped topping to keep the carb count at about 13 carbs per serving. Or go for the classic cream cheese frosting spread over the cooled bars. This lower carb version of cream cheese frosting uses about half the powdered sugar of most recipes so adds about 8 carbs per serving. It is light but flavorful and a perfect complement to the pumpkin flavor. Add walnuts halves in the center of each frosted serving for another classic fall touch. A perfect, moist and comforting transition dessert that leads us right into fall! Bonus question — Did you know that pumpkin is both vegetable and fruit? Botanically, fruit is a flesh surrounding seeds. So cucumbers, tomatoes, beans and pumpkins are fruits. Vegetables are those things which do not have seeds as part of what is eaten. Celery, radishes, carrots and lettuces fall here. Confused? In culinary terms, fruit is sweet and fleshy and can be eaten raw. And everything else is considered a vegetable. The one thing we can be certain about is the tomato – well, sort of. The US Supreme Court ruled in 1983 that the tomato is a vegetable, even though it had been classified botanically for centuries as a fruit! Delicious spiced pumpkin bars topped with classic cream cheese frostings -- a fall favorite! Beat together eggs, sugar, oil and pumpkin till light and fluffy. Bake at 350 for 25 – 30 minutes, until toothpick inserted in middle comes out clean. Serve warm or cool with whipped topping or ice cream. OR Cool to touch and frost. Beat all ingredients together until light and fluffy. Spread uniformly over cooled bars. These NEED to be at my Thanksgiving table! mmmmmmm. I would be honored if you would come share it at my Recipe of the Week #3, Thanksgiving Favorites post. I think the readers would LOVE this one. Feel free to also add any other favorites you have. As always…there will be a small gift card for the winner 🙂 Fun! Thanks for the invitation, Corey! I linked up the Pumpkin Bars and the Sunny Broccoli Salad. Both are soooooo yummy! Thank you so much Charlene! Your recipe is featured on Full Plate Thursday this week. Hope you will have a great week and enjoy your new Red Plate! Thanks so much for the feature last week! What a delightful surprise — and I will enjoy the Red Plate! 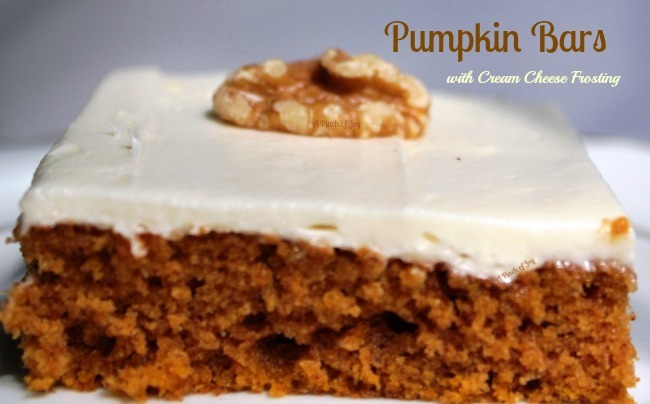 These look amazing, I’ll be featuring them tomorrow on my blog http://www.trilogyedibles.com for great pumpkin recipes from around the web! Your Pumpkin Bars look so good. I might just make your recipe today for a treat! Thank you so much for sharing with Full Plate Thursday. Hope you are having a great week end and come back soon! what a delicious fall treat!